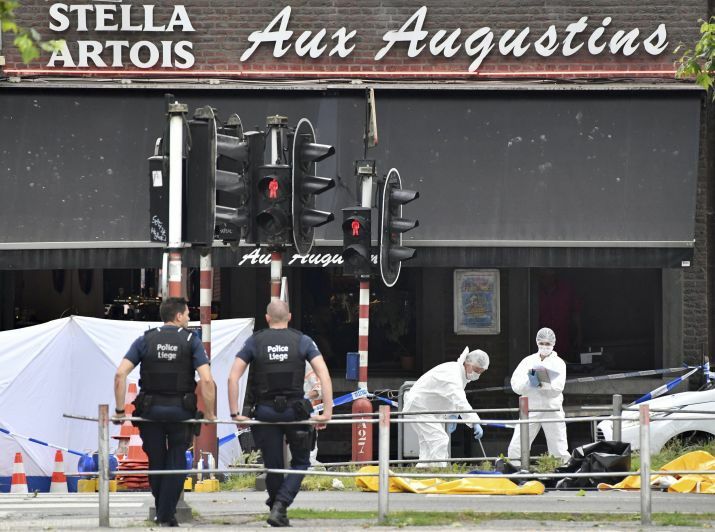 Liege prosecutors’ spokesman Philippe Dulieu said the man approached two police officers from behind carrying a knife and stabbed them several times. “He then took their weapons. He used the weapons on the officers, who died,” Dulieu told reporters. Liege: A knife-wielding man stabbed two police officers Tuesday in the Belgian city of Liege, stole their weapons and shot them and a bystander dead in an attack that prosecutors fear could be terror-related. The attacker, who was later killed by police, was an inmate who had been granted a few hours release Monday but failed to return to prison, officials said. It wasn’t immediately clear why he was imprisoned, but media reports say that he’s a known drug offender. Belgian Prime Minister Charles Michel said only that “there was a serious incident.” He later met with Liege city officials. Yves Stevens of Belgium’s federal crisis center said that security in Liege is now under control, and that there was no reason yet to raise the national terror threat level.